San Diego Comic Con reveals from Funko, Gentle Giant, and more. On this special episode of First Order Transmissions, I take over hosting duties and am joined by Dan Curto and Chris Salton as we discuss the latest in Star Wars news including new ultra-high end collectible props, the overblown report(s) of Rogue One going through extensive reshooting, and the current state of collecting. You can watch the show by clicking on over to the dedicated YouTube channel or watch right here. 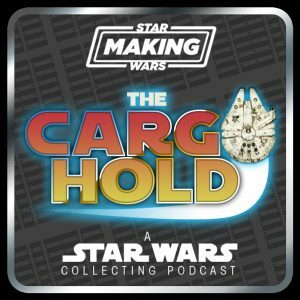 After taking a post-Star Wars Day break from the show last week, Flyguy and I are back to discuss the latest in Star Wars collecting. A mysterious Black Series set of astromechs turned up in Hong Kong and we speculate on its destination. Funko dropped their new Smuggler’s Bounty this week and we break down its contents and criticisms. Plus, Rogue One had a series of “spoilers” drop this week in terms of characters names, aliens and vehicles. All of this and more PLUS our latest acquisitions on Episode #97 of The Realm Recap. We are one week past Force Friday, but the aisles look like the week before. The desired product is virtually wiped out with only drips and drabs of stock replenishment taking place. To add further insult to injury, Kmart set many collectors up for failure in trying to obtain their exclusive 6″ Kylo Ren by launching a very early Sunday morning preorder. Is there hope for the modern day collector in this environment? We also discuss some of the latest product reveals from figures and vehicles to more exclusives. All this and much more on episode #75 of The Realm Recap! George Lucas’ 1977 space fantasy Star Wars changed the way American audiences consumed films. More, though, it also changed the landscape for movie merchandising, with more money being made on toys, games, and collectibles than on the movies themselves. Now the documentary Plastic Galaxy looks back at the first generation of Star Wars toys, released between 1977 and 1985 from Kenner. Does this film capture the childhood magic of Star Wars figures, and can the documentary appeal to anyone not already obsessed with little plastic Stormtroopers? Find out in this special Now Playing/Star Wars Action News crossover podcast hosted by Marjorie, Arnie, and Jerry! Our show returns this week as Flyguy and I discuss the latest in Star Wars collecting and just in time. It appears that the drought is lifting as new product is shipping to and being received by collectors. New Black Series, Star Wars Rebels, and Saga Legends/Mission Series are all starting to show up online and in stores. Sideshow comes through huge this past week with a few preorders that are sure to put a dent in the wallet and Bandai again tempts collectors with their expanding line of samurai-themed figures. Episode VII and Star Wars Rebels gets a few hits this week as principal filming has wrapped on the sequel and we now get a clearer understanding of the Inquisitor’s task by way of new Vader footage on a special telecast of Star Wars Rebels: Spark of Rebellion. This and much more on Episode 38 of The Realm Recap! The Realm Recap is back again this week picking up where we left off with NYCC news as we touch on a few developments released through QnAs from various sites in attendance. Hot Toys surprises this week with the tease of a new 12” Stormtrooper – which may be more than meet the eye (oops, wrong franchise). 2015 LEGO set images were revealed/leaked this week, again running the gamut of source material and they all impress. Lots of Star Wars Rebels news this week with new (and free) shows, the return of James Earl Jones and Kanan getting an original story in 2015. This and much more in Episode 35 of The Realm Recap! On this week’s show we discuss the latest in toy news hitting online, in store and our pocketbooks. Also, there is an apparent disturbance in the Force surrounding a certain Dark Lord of the Sith figure that is making its way to collectors. Flyguy and I get our heads on straight to discuss whether or not it’s warranted or should be ignored. This and much more on The Realm Recap! Click on through to check out the latest episode and feel free to subscribe to our channel and leave suggestions on what you’d like to see covered on the show.